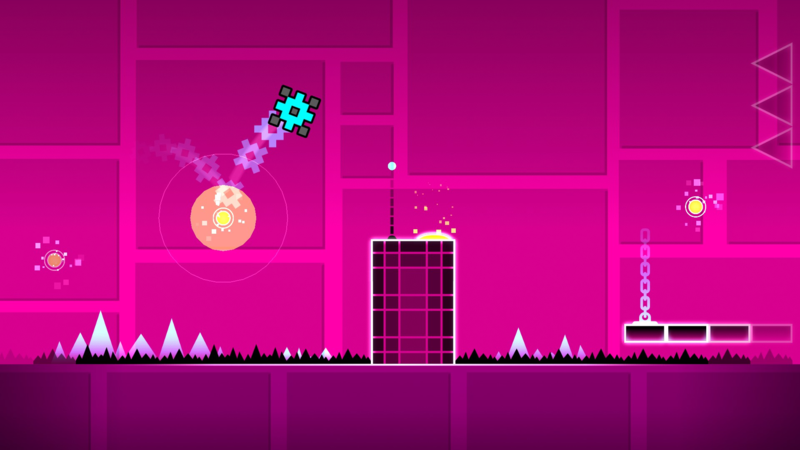 Quick Breakdown: An ultra-hard auto-scrolling 2D platformer. 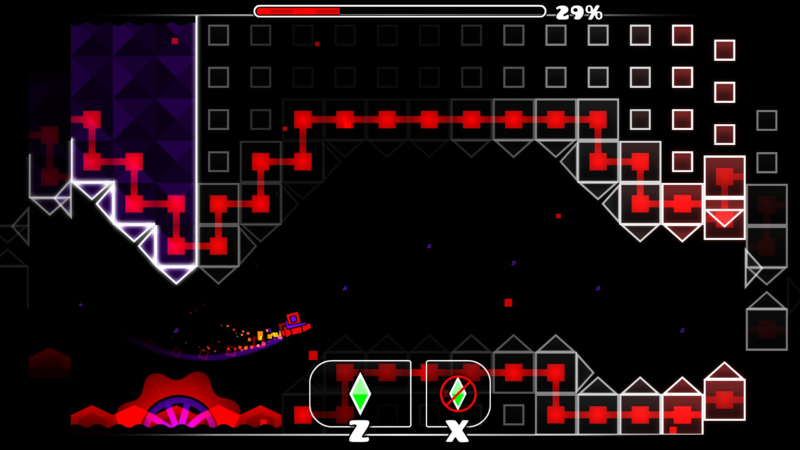 You play as a cube, and the only thing you can make it do is jump on command. Full Review: Where to start with this game? The trouble is there just isn’t a whole lot to talk about. Usually I start my reviews with a bit about the story, or the setting, or core gameplay mechanics. But you only use one button for this entire game. You play as a cube that moves across the screen from left-to-right, and you use the spacebar to make it jump, in order to avoid obstacles. 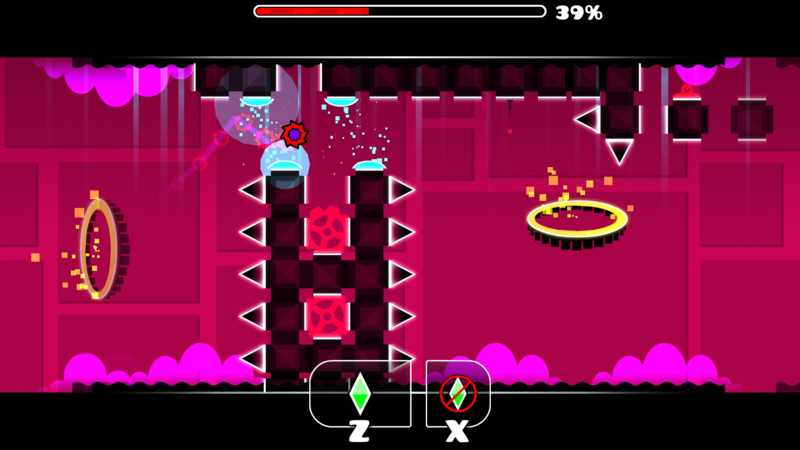 The cube moves from the left to the right automatically, so you are only able to control when it jumps. Pretty simple stuff, but the game is incredibly difficult, as collision with any obstacle kills you immediately. 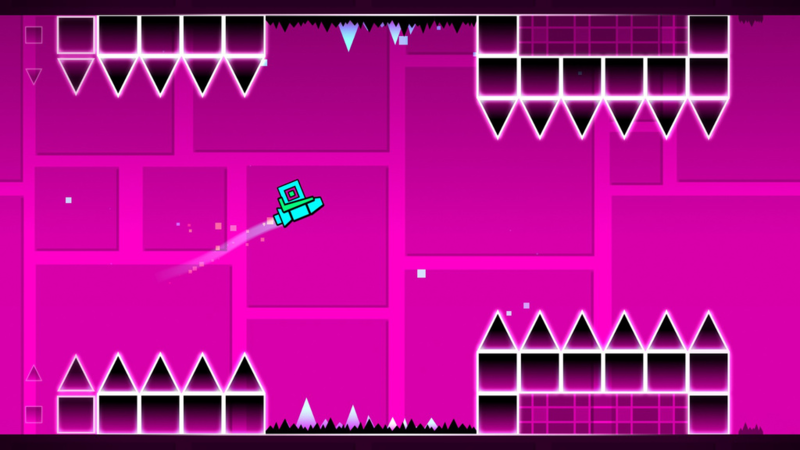 A single mistimed jump equals death, and you have to complete the actual levels in one go from start to finish. If you die you restart from the beginning. Thankfully, there’s a practice mode that allows you to place checkpoints at will. The game may sound a little boring from the above description, but fortunately has other mechanics to keep things interesting. It's not just mundanely jumping over obstacles; there are pads that launch you higher than a normal jump, suspended orbs that will let you jump midair (you must still press the spacebar though), rings that will flip gravity when you pass through them, and other rings that will flip which direction you are travelling across the stage (from moving left-to-right to moving right-to-left). Additionally, some rings will also cause your cube to transform into a spaceship that glides through the air. Holding the spacebar will cause it to rise, while not holding it causes it to fall. Another ring transforms you into another type of spaceship that "hops" across the screen each time you press the space key. There are other mechanics as well that help create variety in the gameplay. 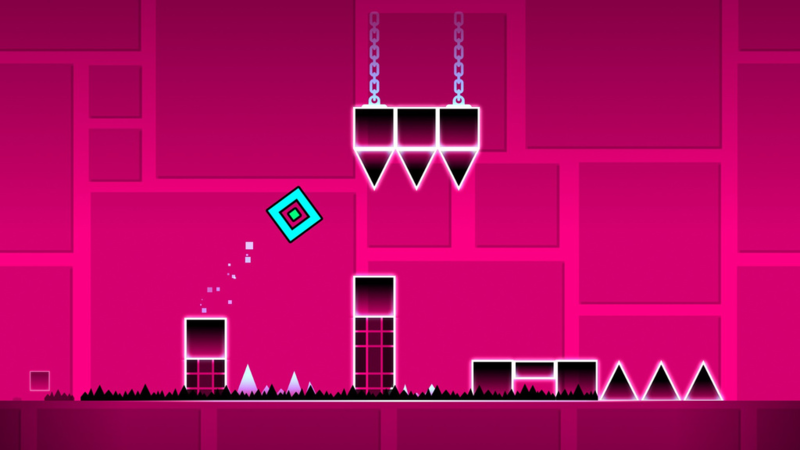 The game's level design really shines through when it combines different obstacles and mechanics. To illustrate this point better than it can be described in text, I'm including a video to help illustrate the point. (Note: You can slip 16:10-20:25, as for some inexplicable reason that is a repeat of the previous four minutes of the video). The game's soundtrack contains some pretty good tracks, so you get to hear some nice tunes as you play through each level. However, the music used during the practice mode is rather lackluster. This is a shame, since the difficult of the levels required me to spend most of my time in practice mode. Consequently, I didn't get to hear most of the game's music during play. That difficulty curve I mentioned? It's pretty crazy. As I played the first couple levels I thought to myself "this game is tough, but this shouldn't be ranked up there with other really hard indie games to be released in the past few years". I hit a roadblock not long after, and began to see why it was considered so hard. I was only able to complete the first 5 levels on normal mode, and had to resort to playing practice mode for the rest of the levels. I went back and replayed the early levels again after finishing the game, and realized just how easy they were in comparison to the later levels. You probably will not be able to beat most of the levels in the game on normal mode (though kudos if you do), but despite that, the game is still fun, and that shouldn't discourage you from playing it. There's also a level editor for the game. You have the option to upload your custom made levels online, and download other players levels as well. I didn't play around with either of these features much, so I can't really talk about them in any detail. It took me about 4 hours to complete the game on practice mode, as well as to complete the first 5 levels on normal mode. I wasn't able to complete most of the game on normal, so I'm not sure exactly how long that would take. The game only costs $4 on Steam normally, so giving the game a chance won't break your wallet; but if you are feeling frugal, you can wait for the Steam sale like everyone else.